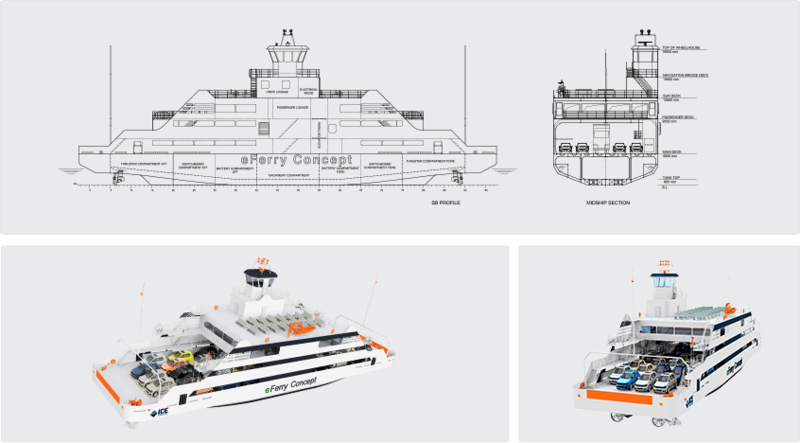 ICE has developed a design for a fully electric battery powered passenger and car ferry. The 60-meter vessel can accommodate 200 passengers and 45 cars on a single car deck for quick and easy loading and unloading. The shallow-draft double-ended mono-hull ferry will be propelled by four 750 kW propeller pods, achieving a speed of 15 knots in open water and operating with 10 knots in harbour. Remotely operated battery charging stations will be fitted shore-side on each terminal, which will also be equipped with magnetic pad mooring mechanisms to unmanned moor and release the vessel quickly and securely in a variety of tidal conditions. ICE has designed a double hull Handy-size bulk carrier with large hatches that is robust, flexible and economical. It is compliant with the latest relevant Common Structural Rules. 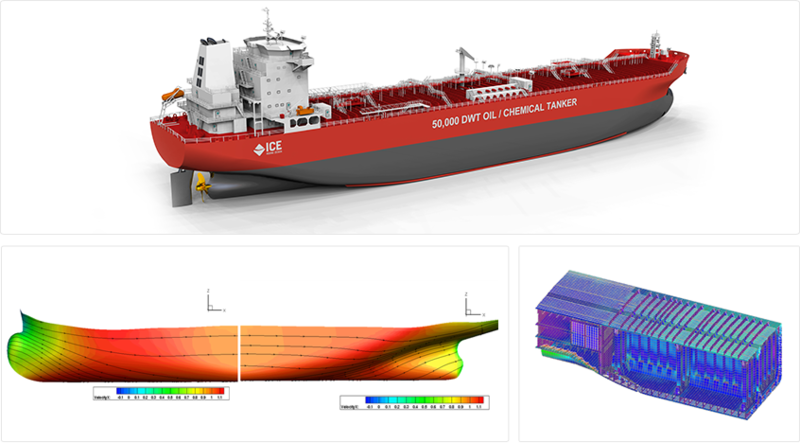 The hull form has been developed by use of advanced computational fluid dynamic (CFD) analyses and has thereafter been extensively tested in ICE’s own ITTC-approved towing tank to obtain the lowest possible hull resistance. The 32,000 dwt vessel is suitable for carrying a wide range of bulk cargoes, such as: coal, grain, ore, cement, alumina, bauxite, bagged cargoes, steel coils, industry log, lumber and plywood. She is laid out with 5 cargo holds and equipped with four 30 tonnes SWL deck cranes (holds 2, 3 and 4 are fully box shaped and holds 1 and 5 are semi-box type with lower hopper slopes as necessary to provide double skin). The vessel is designed to be an ocean going bulk carrier with bulbous bow, transom stern, raised forecastle and poop deck, open water type stern frame, single rudder and single screw propeller driven by a slow speed diesel engine. ICE has developed a well-balanced large-scale fully refrigerated gas carrier hull design with a carrying capacity of 84,000 cubic meters, compliant with IGC 2016 rules. The vessel is designed as a fully refrigerated liquefied petroleum gas carrier, with four (4) independent Type A tanks, with a 2G hazard rating. Low speed engine combined with high propulsion efficiency and an optimised hull form result in a low fuel consumption. The vessel is very well balanced so no ballast is required for entire voyage in fully loaded and segregation conditions. The design can be adapted to incorporate a wide range of proven equipment and systems enabling selection of competitively priced solutions from proven suppliers. 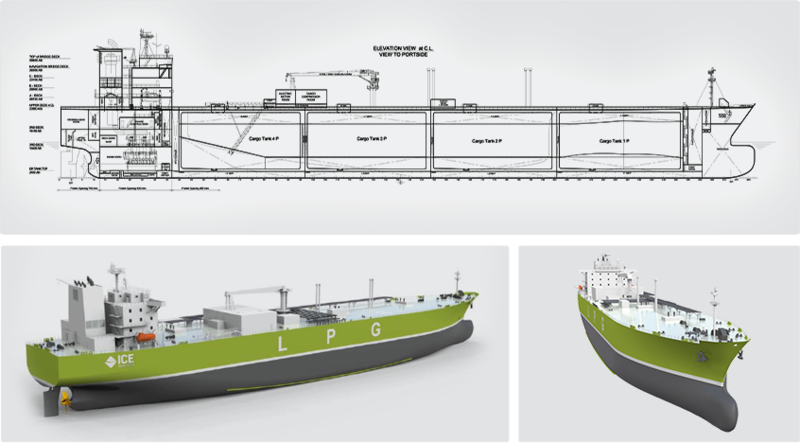 ICE has designed a shallow-draft gas carrier, with a cargo capacity of 20,000 cu. m. in two type C bi-lobe cargo tanks, semi-pressurised and fully refrigerated. 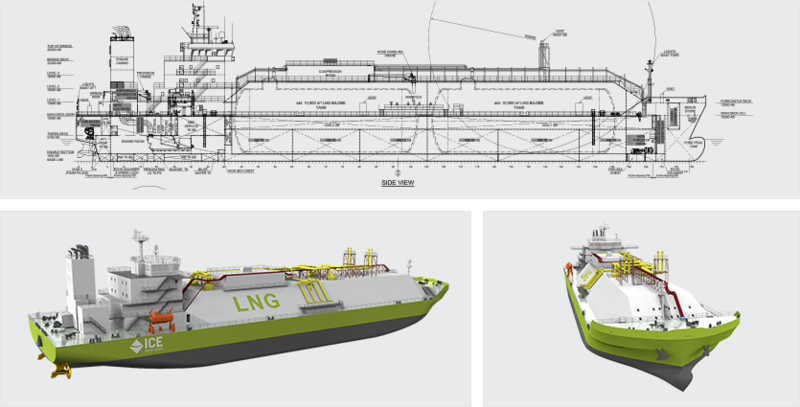 With a five-meter draft, the vessel is designed for both seagoing service and to meet the LNG delivery challenges presented by shallow rivers and restricted harbours. The Cargo Containment System (CCS) facilitates “milk-run” type delivery to a variety of small and medium size terminals, allowing partial loading levels of cargo tanks and atmospheric pressure discharge. 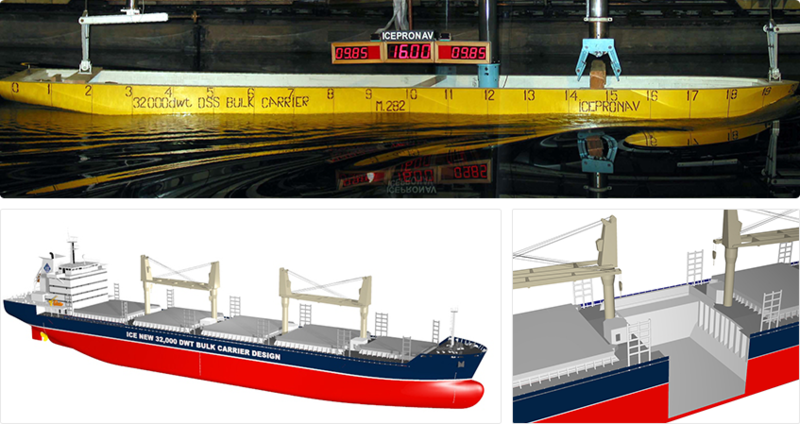 The type C bi-lobe cargo tanks have been dimensioned to maximize cargo-carrying capacity within a given set of hull dimensions and draft restrictions, without altering the ship’s performance. The dual-fuel propulsion system is able to run on cargo boiloff gas (BOG) or distillate fuel. BOG utilised as fuel allows the vessel to comply with sulphur emission control area (SECA) restrictions and to manage the amount of BOG during laden trips. The concept is open to design variations in terms of overall vessel size and propulsion system arrangement. ICE has designed a robust and economical tanker for transport of crude oil, oil products and IMO Type 2 & 3 chemicals, with six cargo separations. Extensive model testing in ICE’s own ITTC-recognised towing tank combined with Computational Fluid Dynamics (CFD) analysis has resulted in a highly efficient hull form. The 50,000 dwt tanker has a double-hull structure meeting international requirements for the prevention of marine pollution. Segregated fuel tanks for navigation world-wide as well as in ECA waters are included. A Global Finite Element (FEA) analysis has been developed by ICE in accordance with the new IACS harmonised Common Structural Rules (CSR), enabling fast completion of the remaining design process to suit speciﬁc owner and yard requirements. 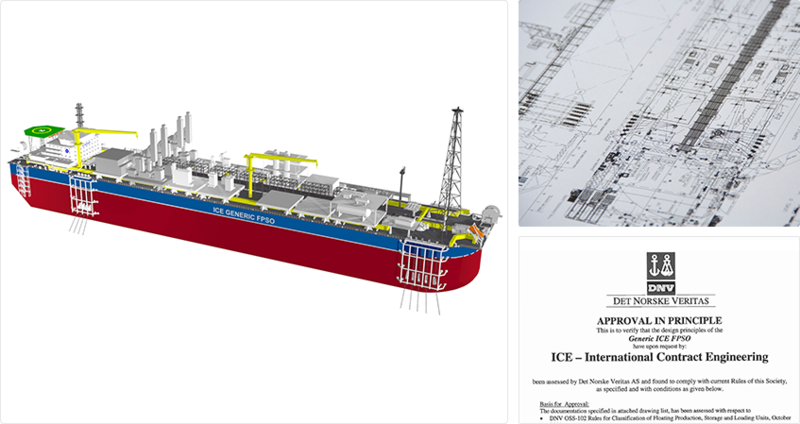 Enabling FPSO newbuilding projects to have a quick start-up and save costs, ICE’s FPSO hull designs provide a suitable platform for a wide range of FPSO topside and mooring configurations. The barge-shaped designs feature double sides, a single bottom and a rounded bow to minimize slamming. The designs are economical to build using conventional shipyard technology and can be assembled from joinable hull modules built in more than one yard. The design capable of storing 1.6 million barrels of oil available for discharge, with an offloading capacity of one million barrels of oil per day, has been granted DNV approval in principle. A design with an even larger capacity is currently being developed.